(Nanowerk News) Tiny gold particles will surround themselves with even smaller platinum bits, creating a complex structure that could turn a common preservative, formic acid, into electricity in a fuel cell, according to scientists from China's Harbin Institute of Technology(Offsite link) and the Pacific Northwest National Laboratory. The team used a novel electrostatic self-assembly method to create platinum-surrounded gold nanomaterial. This method relies on the attraction between positive and negative charges to inspire nanoparticles to form new structures on their own. "To our knowledge, this is the first time that this method has been used to create such catalysts," said Dr. Yuehe Lin, a chemist at PNNL and a co-corresponding author of the paper. This paper was named a Very Important Paper by Angewandte Chemie International Edition ("Electrostatic Self-Assembly of a Pt-around-Au Nanocomposite with High Activity towards Formic Acid Oxidation"). Less than 5% of the journal's manuscripts receive such a positive recommendation, and this was the only one in the current issue. 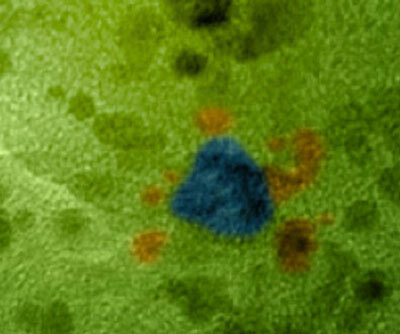 Gold particles (colored in blue) will surround themselves with even smaller platinum particles (colored in orange), creating a structure that could turn a common preservative into electricity in a fuel cell, a study by according to scientists at China's Harbin Institute of Technology and Pacific Northwest National Laboratory. Replacing today's batteries in laptop computers and other portable devices with liquid fuel-powered fuel cells could ease consumer frustrations. The fuel cells would last 2 to 10 times as long as today's batteries. Further, the laptop computer could be recharged instantly, because it relies on formic acid, not electricity. In addition, this kind of fuel cell can be used as a battery-electric vehicle range extender if assembled into a stack. But, such fuel cells must have efficient catalysts to create the needed power. This research provides fundamental insights into designing such catalysts. Designing this catalyst began with two solutions. The first held tiny, positively charged platinum spheres, about 2.8 nanometers wide. The second solution held negatively charged gold particles, about twice as wide as the platinum. The scientists mixed an excess of the platinum solution with the gold solution. The particles formed into a flower-like structure, with the platinum in the center surrounded by gold petals. The self-assembly was driven by the attraction between the positive and negative particles and the repulsion between nanoparticles with same charge. After creating the particles, the researchers examined them using x-ray diffraction, transmission electron microscopy, and energy-dispersive x-ray spectroscopy. These capabilities were all found at EMSL, Environmental Molecular Sciences Laboratory. Scientists mixed an excess of a solution containing positively charged platinum spheres with negatively charged gold particles. The particles formed into a flower-like structure, with the platinum in the center surrounded by gold. The self-assembly was driven by the attraction between the positive and negative particles and the repulsion between nanoparticles with same charge. The team tested the catalytic efficiency of the platinum-surrounded-gold particles. They applied the particles to formic acid. The particles catalyzed the removal of the two hydrogen atoms, producing carbon dioxide and electrons to drive the fuel cells. The new catalyst generated 5.7 times the current density of platinum nanocatalysts alone, a significant improvement over today's catalysts. The scientists are studying how the atoms and electrons from the catalyst and formic acid interact to understand why this innovative catalyst is more active than they expected.